A young girl is in a riding accident, and as a result ends up in a wheelchair. She refuses to speak and hardly does anything for herself. Her father hires a "zoo therapist" who uses animals to help kids learn how to do as much as they can on their own. They move to a ranch where a beautiful spirited paint horse named Wind Dancer becomes her "therapy horse." 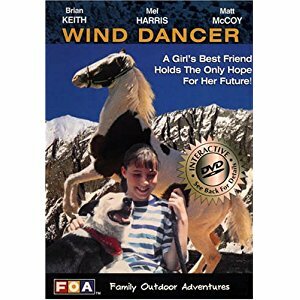 Therapy turns into adventure as a villain tries to steal Wind Dancer. I enjoyed this movie and hope you do too! I first saw this movie years and years ago. The title has escaped me for so long, known in my mind only as "that horse movie with the girl in a wheelchair". Thank you so much for bringing this movie back into my life. OMG OMG OMG BEST MOVIE ON THE PLANET! I LOVE LOVE LOVE LOVE THIS MOVIE! I have watched it, and I really love it! It's so cool. Oh, the villain is actually a stable hand. So amazing! I don't know what movie you are thinking of. And it's probably also called Winds Dancer. But this one IS about a girl who falls off her horse and doesn't wanna talk! It's a pretty good movie! But there is one plot point I can see coming a mile away! You know what the bad guys gonna do and who he is and there is alot of driving. But otherwise a good movie! It is a touching movie and is very realistic in the first scenes it is very tragic but happy at the same time. In some scenes i feel like helping her push the wheelchair, the girl is a good role player. Sounds awesome. I really want to see it. i love this movie u just got to watch it..........!! I loved this heart-warming story! This is a heart-warming story, i could watch this movie over and over again!